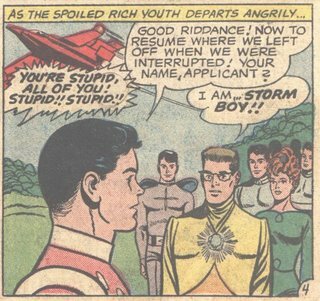 Before we got down to the nitty-gritty of the events surrounding Storm Boy's application to the Legion, let's take a look at appearance. His hair: square and marine-esque, it probably said someting to the DC audience of the time, but I'm not sure what. This was the early sixties, and I'm not certain at what point the owner of such a haircut would have metamorphosized from an upstanding young man to a complete and utter square. In any case I like his hair, because of its rarity in the comic medium - you're not likely to find it on anyone other than Sergeant Rock... and maybe Captain Atom. I like his glasses even more, and for the same reason: superheros don't wear glasses (Clark Kent et al do not count). And I wear glasses, so. Plus, this thing's set a thousand years in the future! I honestly would have thought that by the year 2962 (or whenever) children would be scanned in the womb and at the first sign of myopia the cloning process would begin. New eyes would be grown in a matter of minutes and installed in utero, and the entire family would henceforth speak of 'Billy's little problem' in hushed tones when he wasn't around. Assuming that my powers of prediction are infallible - and permitting myself a lapse into vulgarity - this guy's eyes must be fucked up! Moving on, Storm Boy's clothing is a standard 30th Century jumpsuit. For a while I'd thought that he was wearing a glowing jewel around his neck, but I recently realized that that thing is his superhero emblem - he's chosen to represent the awesome powers of the thunderstorm with a little glowy cloud thing. Questionable, but we all just have to remember that the guy's eyes are fucked up. Enough with the fashion critique. It's time for the nitty-gritty! Oops! He was doing it with a little device in his pocket! 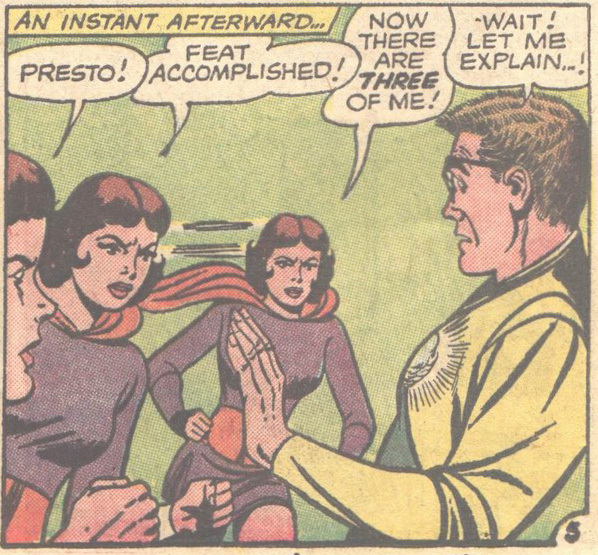 And that's the number one rule when seeking membership in the Legion of Superheros: you gotta have your own powers. 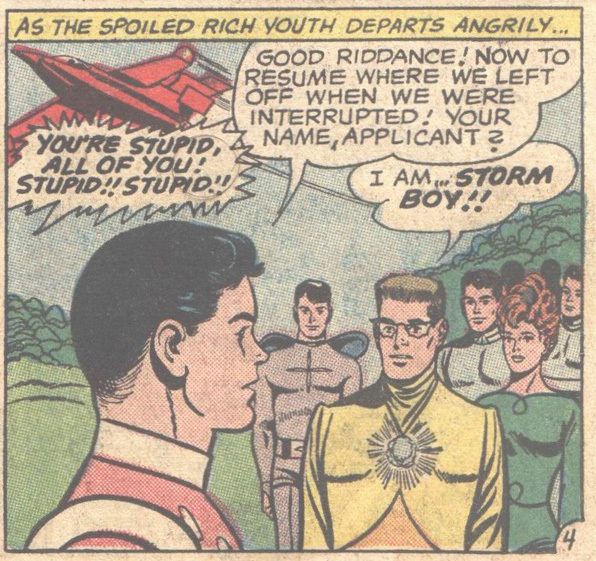 Storm Boy's little remote control is a big no-no, and one that he likely knew about, which is why I ask the question: why'd he do such a bad job of using it? Sticking his hand in his pocket like that. So disappointing, but even if he wasn't a moron and hid it in his boot or something what did he expect to happen? Did he think that he'd do well as a member and that everyone would just laugh it off when they found him out? Listen, Storm Boy, if a Legionnaire loses his or her powers at two o'clock they're out the door with a selection of erased memories by four thirty. They don't even get a party. And that's Sun Boy - you they'd probably hunt for sport. 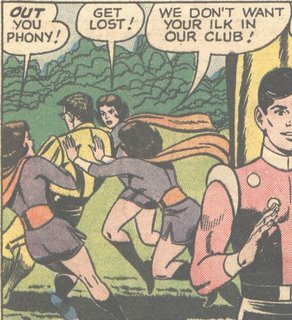 They get Triplicate Girl to kick him out and think no more of it. 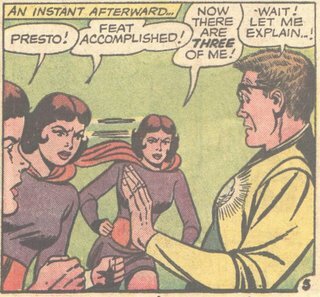 And that, if you were wondering, is why they keep Triplicate Girl around. 1) I sure hope that this wasn't one of those needlessly complicated comic books schemes where, say, Storm Boy's sister has been kidnapped by gangsters and he's not allowed to go to the police but he figures that if he joins the Legion he can trick them into rescuing her. Because they didn't really give him a chance to explain. 2) Did Cosmic Boy give back that storm-making device? "Hey guys! I got a new power! I'm magnetic and I can make storms!"